Hair and hairstyles have in different cultures a social status. They can be a sign of youthfulness, health, strength, care, class. Thus, they are not only aesthetically pleasing and fashionable important, but it may also have a psychological effect for the wearer. The comb dates back to 9.000BC but then served mainly to carding and weaving (to press wires), to hackle (separating bark from fibers) and harvest corn spikes. On average, blondes have 140,000 hairs, brunettes 100,000, redheads 85,000, women 130,000 to 150,000 and men 150,000 to 180,000 hairs. Women have more hair than men. Without clipping it can become in males 40-50 cm and in females to 70-80 cm. long. Hair grows about 1 mm. in three days, or approximately 1.25 cm per month, so 15 cm per year. With 80,000 scalp hairs so that daily 25-30 m, or about 800 m per month is formed. Thus, there is an intensive metabolism. With aging, the growth rate can be reduced to only 0.25 cm per month. Each hair can last at normal health, one to six years. Normally people lose about 100 hairs per day. The shed hairs are ten to twelve times replaced by new ones that grow from the same root. Afterwards (approx. 25 years) can baldness occur. It is a myth that hair and nails of a deceased person continue to grow. That only seems like that, because the skin dries out and retreats, making e.g. stubble more visible. Hair is in mammals a skin appendage of dead cells composed of the protein keratin. Each hair has a hair follicle with muscle and nerve fibers that even register small perturbations such as drafts. The adjacent sebaceous gland keeps the hair and the top layer of skin, the stratum corneum, smooth. A hair is composed of its scales which overlap each other like roof tiles. If they are going open it may lose its luster, splitting or breaking. Dread (lock) s are bundles of felted hair. If you do not comb the hair tiles they can stick together hooking and tangling. Washing too hot or too much soap dries skin and hair. The commercial word shampoo (to wash hair) exists since last century (USA). (Formerly meant "massage".) Shampoo degreases, therefore the sebaceous glands are stimulated to produce more sebum again. So much more you wash it, much faster it becomes fat. That fat is actually your natural hair conditioner. Instead of washing that (too often) away, you would have to comb it through your hair. 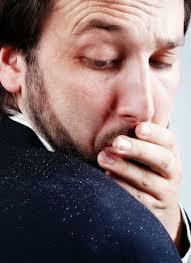 Dandruff (seborrheic dermatitis, or seborrhea, Pityriasis capitis) are flaking old cells from the scalp. Which renews itself continuously, in about 3 weeks. The chips are normally small and invisible. With dandruff the renewal process is faster and creates more and larger flakes and itching. Factors that play a role in the etiology of dandruff is the greasiness of the skin (the amount of sebum made by the sebaceous glands) and the presence of certain yeasts (Pityrosporum ovale, now called Malassezia). These yeasts (e.g. Malassezia furfur - globosa and - restricta) live of the essential oils from the skin. They produce enzymes that break down fat from tallow to fatty acids. These fatty acids irritate the skin and cause seborrheic dermatitis. With increasing oil production in the scalp occurs a better breeding ground for yeast and can they grow quickly. In patients without dandruff yeast also occurs, but much less. About 40% of the people has ever experienced. In men it rose more than women. It is not possible to get rid of yeast forever. Anti - dandruff shampoo may solve the problem. It contains selenium sulfide or zinc pyrithione that slows down the rapid production of skin cells. Rinse with lime blossom tea would also help. Rinse with vinegar is sometimes recommended. I can imagine that an acid (or salt) environment is not conducive to ferment. And that you should change the remedy regularly, not to grow resistant strains. Although my head has but a fraction of his hair anymore, I do use conditioner. Combing is much easier. A conditioner adds volume and shine, and works as a moisturizer, detangler and acidity regulator. The cuticle join by this so the hair looks shiny and is easy to comb. This can also with lemon juice (with a pH value of 2 it is actually slightly too acidic) or vinegar water (half-half). Avocado with some (lavender or nut) oil would also be a good conditioner. Take some rosemary and chop it into small pieces. Heat (do not boil) a tablespoon of almond oil, glycerin and lanolin and rosemary in a cup of water. When it has cooled, add the beaten egg to it. For dry hair, only the yolk. Let the homemade conditioner for at least ten minutes in your hair, and rinse warm. You can keep the conditioner a few days in the refrigerator. A razor is a very sharp knife to remove body hair. You do not need 5 slats or rotary heads. Making aftershave: fill a bottle with the same amount of apple cider vinegar and water and shake well. The antiseptic action of the vinegar will disinfect the skin, it restores the moisture balance of the skin, closes the pores and soothes the "burn" after shaving. It is a myth that shaving stimulates hair growth. You only take away dead material over the skin layer, it does not affect the growth. Sometimes you do get the impression, like feeling stubble should be harder, grow faster or darker. About 2% of the world, dating or emigrated from northern and western Europe, has naturaly blond hair. Men find it attractive. Like a Barbie doll: long hair, blonde, blue eyes, young, long legs, a full bosom, a wasp waist. Lang hair would indicate a long period of good health. Light coloured hair symbolizes young. Later, the hair is usually darker. Also large and firm breasts indicate a youthful and reproductive age. Long legs and narrow hips would betray the presence of fertility hormones. Blonde women would have slightly more estrogen (female hormone) than brunettes. Despite the description 'dumb blonde' many women want to go as attractive fake blondes through life. Artificial bleaching the hair, plastic surgery, diets and exercise programs to optimize the shape of the body: the game of seduction and conquest applies for centuries with the same rules. (In the Solomon Islands, near Australia, live tribes with dark skin and light blonde hair. Gene TYRP1 is responsible, American geneticists discovered. Anyone can be a carrier of one of the three common 'red head' variants in the MC1R gene, and receive red-haired children. If both parents are carriers, one child in four can be red haired. 0.5 percent of the world is redhead.